Welcome aboard at famous Truk Lagoon! This report is from a ship supplying the widest diving and sightseeing experiences at this great WW2 shipwreck site. Thirty-three years of varying modes has led to a refined system presenting broad views of near countless shipwrecks and aircraft downed in 3 major attacks by US forces 76 years ago. Special dispatches to outer reefs and coral heads can complete extended views of excitingly brilliant aquatic life at this unparalleled shipwreck location. Diving continuously on a 24/7/30 basis from moorings within sheltered central wreck anchorages, Thorfinn divers move quickly to adjacent wreck and reef sites by speedy ‘state of art’ 300hp twin engined 32 ft. launches assuring maximum varieties in quality wreck and reef sites at Truk Lagoon. Featuring up to 5 different daily sites, small groups enjoy fine views and penetrations… free of other divers at singly moored locations. By avoiding single site moorings with limited selections, Thorfinn divers enjoy fine views of up to 30 appealing sites during 7 continuous dive days aboard, with experienced guides on every dive, each leading small parties of 4-6 divers safely to the best below. This system provides the most for every budget, as knowing divers quickly appreciate after sampling differences in cost and product delivered. Personal facilities and great food are just minutes from each dive site, avoiding long rides to distant shore facilities, or tossing at exposed anchorages aboard lighter dive vessels lacking the size and stability of this 1,100 ton ship. Safe diving profiles follow long established rules producing one of today’s most admirable dive safety records. Full safety gear aboard launches and ship assist in maintaining this record.. Newly installed high volume oxygen generators produce breathing gas volumes well in excess of all needs for full ship charters to 20 technical or recreational divers. Multiple cylinder sizes and arrangements are filled quickly and accurately at an onboard blending station catering to near every request. A large ship’s staff readily welcome everyone to enjoy the delights fully served from this great ship,… our floating home at a central Pacific Paradise..! 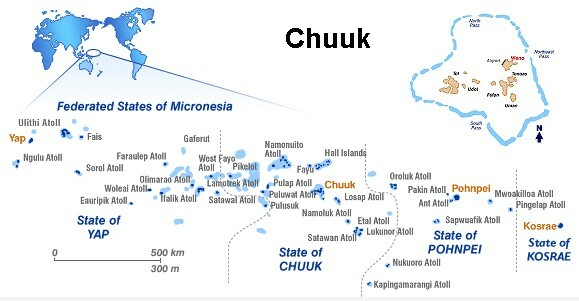 Truk Lagoon is centered within Chuuk State of the Fed States of Micronesia and is famous for its giant oceanic lake surrounded by a huge barrier reef and islands. The lagoon is the final resting place for more than 100 ships, planes and submarines – the legacy of a fierce World War II battle between the Imperial Japanese Fleet and Allied carrier planes. Most of its sunken contents remain in their original form after sinking, and are now ruled as an underwater museum with a total ban on artifact removals. The Allied ‘Operation Hailstone’ in February 1944, and two more attacks of April and June ‘44 left the lagoon floor littered with Japanese cargo and armed military ships. Decades later, they have become natural reefs, draped with corals and serving as fish havens, with most wartime artifacts still aboard. They are fascinating sites to visit and many are accessible to any experience levels of divers. Shallower ships have become overgrown reefs hosting species of over 700 fish and nearly 400 corals, plus numerous invertebrates. This location is unsurpassed for quantity of dive accessible wreckage in close proximity, situated in shallow clear waters. Many wrecks are visible while snorkeling, and various on-shore ruins can be viewed as relics of the past conflict. . Most shipwrecks lie adjacent to the high islands of DubIon, Eten, Fefan and Uman, and represent the largest naval loss in history. Their cargoes of tanks, trucks, airplanes, mines, bombs, machine gun bullets and thousands of other artifacts including beautiful china are there still to be explored. The islands of this big atoll are rich with natural beauty, and a 180 mile encircling barrier reef is full of sand spits with overhanging coconut palms. Various mid-lagoon high islands have emerald peaks rising to blue skies. A slow paced life in Chuuk often permits time to enjoy its natural features with lush islands as home to beautiful migratory birds, with occasional bird watchers viewing them at higher locations. Divers are amazed in viewing preserved shipwrecks still in pristine condition following 70 years of submerging into warm, tropic waters. Truk is undisputedly the world’s finest shipwreck diving destination. Wide assortments of hard and soft corals in brilliant colors delight both day and night divers, and vast selections of in-place artifacts testify to its historic preservation by local authorities. Historic items among encroaching jungles include a Japanese lighthouse, perched atop a high island, reached by hiking or driving. Old runways, command centers, gun emplacements, cave networks, hospitals and libraries can be located when utilizing a knowing guide. The most suitable method to explore Chuuk is from aboard a liveaboard dive vessel. Often overlooked outer reefs have wide varieties of pelagic and reef fish along cascading coral walls stretching down into a blue abyss below. Windsurfing and sailing are popular during NE tradewind periods from Dec to late April. Chuuk is a true year round diving destination at equatorial mid-Pacific, with warm sun often interspersed by short sharp tropic showers, reverting back to warm sunshine. A rainy 10 minutes, one hour, or occasional day, bring an annual average rainfall of 85-95 inches, spread unpredictably year round after long years of recorded measure. .
Lagoon visibility runs from 30 ft (10m) up to 100 ft (32m).in differing locations and times. Within lagoon is 84-87F (29-30C) at most all lagoon depths. Daytime temps from 80-90F (30-34C) Night temps about 80F (27C) Slightly drier and cooler during NE trade breezes from December through April. Humidity increases through May to November calms (doldrums). An occasional storm may start from intense ocean evaporations at this ITCZ zone, with a wet humid day gradually intensifying as a system moves westward. There are no predictable Typhoon seasons here. All skill levels of certified divers are welcomed, and their limits will be drawn from observing in-water skills as viewed by our professional dive team. Good breathing control and ability to stay within safe boundaries of their chosen dive system will govern access to certain attractions below. Truk Lagoon contains the remains of 70+ WWII shipwrecks along with numerous aircraft sunk or brought down through a series of major Allied Forces attacks from February to June of Y 1944. There are wreck site profiles to suit every diving skill, from 5 meters to 70+ meters. A short list of popular sites is listed here, now a beautiful blend of history and maritim life. Your excitement will run high on near all, creating difficulty in choosing the most favored. The SS Thorfinn is pleased to offer an exciting range of new all-inclusive plans for divers seeking the broadest site selections at Truk Lagoon. 18-20 island staff provide cheerful personalized service on a 1:1 crew to guest ratio. They range from individually assigned dive crews attending each diver’s needs, to full time hostesses, deck maintenance staff, large machinery staff, and 2 chefs preparing varieties of tasty international cuisine. Special dietary requests are catered as available food supplies permit. All diving is conducted from well designed, ‘state of art’ covered 30ft tenders with each craft diving separate sites to avoid crowding over a single mooring. Diving in small groups, experienced local guides will show the very best attractions at each site. Many have been with Thorfinn for more than 15 years.